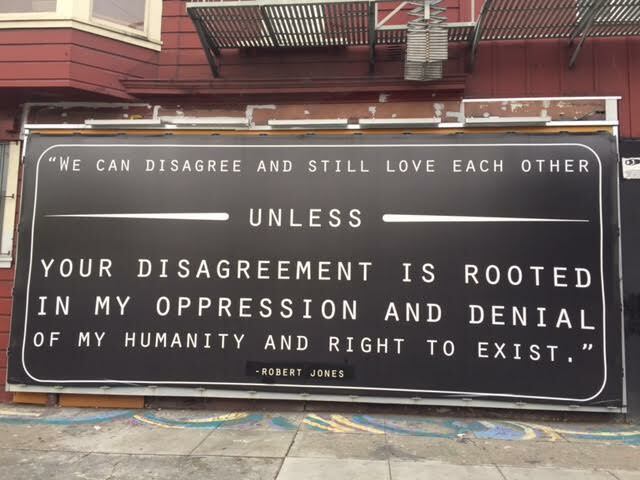 Digital Mural by Robert Jones, Jr.
A note from the author, Robert Jones, Jr.: "I said this originally in response to public disagreements between social justice activists I witnessed on Twitter. I wanted to note that despite having different ways of accomplishing what is essentially the same mission of liberation, it's important to keep each other's humanity in mind. I initially didn't think about the broader impact of what I said until it went viral. I find it especially meaningful given the prospect of a Trump-led America, where bigots have found new energy and resolve. It's a reminder that no dogma supersedes any person's inalienable right to liberty. It's a statement meant to let, for example, the queer-antagonistic business owner know that no matter how fervent their religious convictions, it doesn't grant them the right to discriminate against or dehumanize queer people in the public sphere. That's the price of living in a civilized society. What they believe in their own private spaces is one thing, but the moment they enter public spaces, they must abide by the standard of equity that is inherently ours from the minute we are born, simply because we are born. James Baldwin, someone I deeply admire, once put it like this: "From my point of view, no label, no slogan, no party, no skin color, and indeed no religion is more important than the human being."